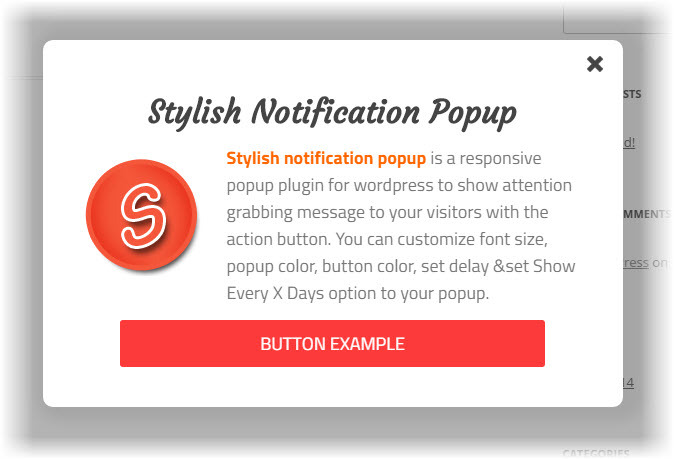 Stylish notification popup is a responsive popup plugin for wordpress to show attention grabbing message to your visitors with the call to action button. Stylish notification popup comes in free and pro versions, free version comes with basic functionalities and Pro version let you customize font size, popup color, button color, set delay and set Show Every X Days option to your popup to avoid disturbance for your visitors. How Stylish Notification Popup Plugin is Useful? Stylish Notification Popup is a responsive plugin that adapts with PC, tablet and mobile devices perfectly. This popup plugin uses WYSIWYG editor in the backend which allows you to customize the text with color, bold, italic and other basic text formatting options. You can also add images inside the popup.